We are a group of dedicated, unpaid volunteers who spend countless hours and much of our own money rescuing cats. We welcome new volunteers in the areas of fostering, transportation, medical care, adoptions, and fundraising. Donations are much appreciated and will be used entirely to promote the welfare of our rescued kitties. We are a nonprofit 501(c)(3) corporation and donations are tax deductible to the full extent allowed by law. PetSmart Special Adoption Weekend is this weekend Saturday from 9:30am to 4:30pm and Sunday from noon to 4pm. We have many adorable cats ready for the forever homes, so come and see us. Meet Wizzer FIV+ and Crispy FIV+ Wizzer (top pictire), Crispy (below pic) and his siblings were born on August 28th 2017 to a feral mom. The streets are no place for baby kittens so our volunteers decided to trap the feral mom and save all her babies. Unfortunately the mom tested positive for FIV. We were able to find the mom a safe home once her babies were weaned. Now Wizzer and his sister Crispy are the only ones left to find their forever homes. It turns out that Wizzer and Crispy were the only 2 out of the litter that contracted FIV. After multiple tests, it was confirmed that their siblings were negative for FIV but Wizzer and Crispy are positive for FIV. Wizzer happens to be a chronic sneezer. He has been to the vet numerous times, and it is confirmed that he is healthy. He just happens to be one of many cats with a chronic sneeze. But please do not let this discourage you from adopting him! Wizzer is a fun little boy with tons of energy and he loves to play. He also enjoys spending time with his sister Crispy, so we would like to adopt the 2 of them together into the same home. Will someone be willing to open their heart and home to these 2 babies? Crispy is a fun little girl who loves to play. She also enjoys spending time with her brother Wizzer, so we would like to adopt the 2 of them together into the same home. Crispy is shy at first until she gets to know you. But once she knows she can trust you she is a very loving girl. A quieter home without loud and rambunctious children would be best. Will someone be willing to open their heart and home to these 2 babies? For more information on me please call Sandy at (816) 510-4400. Your shopping makes a difference. Do your regular Amazon shopping at Amazon Smile, and Amazon donates to Kitty Cat Connection. To shop, go to: smile.amazon.com/ch/20-8008870. ​Save this website in your favorites! Our kitties will appreciate it! We have 2 different Wish Lists! Raise money for Kitty Cat Connection when you shop online! Over 1,500 of the web’s best stores participate in this free program, and up to 26% of each purchase benefits our cause! Use this link to shop on Amazon and they will donate to Kitty Cat Connection! Please bookmark the link below and use it anytime you visit Amazon.com. Maintaining an animal rescue organization requires a lot of dedication, volunteers & money. 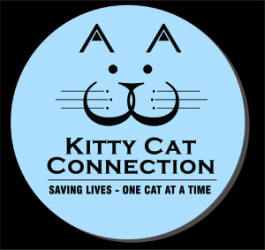 To assist us in our efforts, Kitty Cat Connection has set a goal of recruiting "rescue partners" to join with us in helping support our mission to save cats. Our current goal is to obtain a commitment of $1000 in monthly donations. We hope to recruit 50 - 100 RESCUE PARTNERS who will make an ongoing donation of $10 or $20 a month to help us reach that goal. 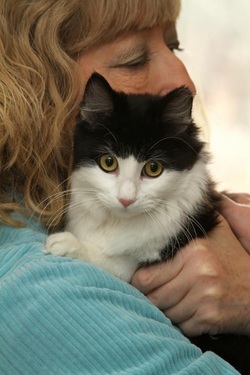 Please consider joining our RESCUE PARTNER program to assist Kitty Cat Connection in rescuing Kansas City area cats from abandonment, death row at kill shelters, abuse & families that just didn't want them any longer. For one time donations, go to the donations tab at the top. You can use PayPal , Google, Cash/Check.